The central notion of Rope's End is that somewhere long gone on the road not taken, lingering in some idealized, unreliable corner of memory, is the perfect person for each of us. A hopeless romantic fantasy perhaps, but a pretty universal one. 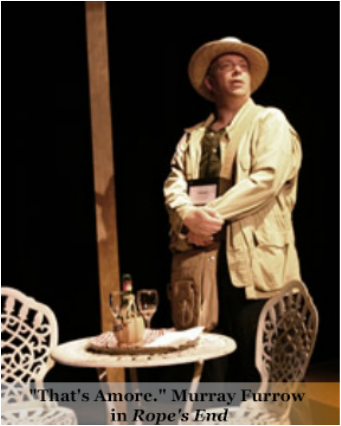 The play begins with a middle-aged man, Toby Boone, alone in a drab room, talking to himself and an imaginary Alex Trebek. He's reached the end of his rope - figuratively - and perhaps literally, because he's trying to tie an ominous-looking loop in a length of rope. The possibility of suicide looms in the air. But he happens across a photo - the love of his life. Maybe she can somehow rescue him, change everything, if he can just get up his nerve to contact her. There's only one small problem. He's let 31 years go by. He last saw her, fleetingly, at summer camp when they were 13. And in 31 years, things change. What if she doesn't remember him? Even worse, what if she does? 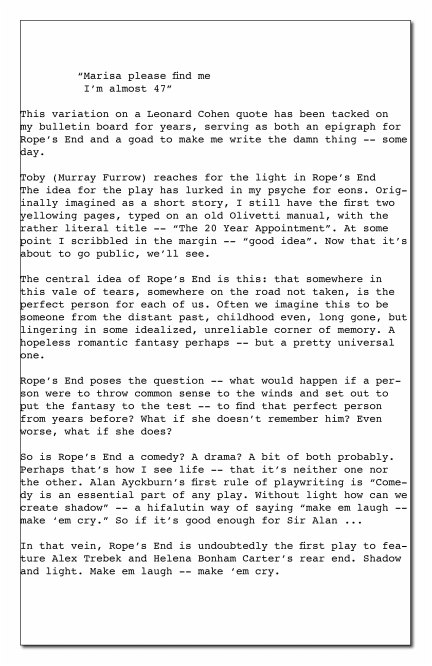 A bittersweet comedy about the choices we make in life, Rope's End leads us through twists and turns, and ends up in a surprising and memorable place. Rope's End premiered at the Thousand Islands Playhouse in August 2006.